Base Notes: White Musk, Iris Powder, Sandalwood, Sweet Amber, Tonka Bean Fragrance Personality: A Land Where Women Reign Supreme On the Indian peninsula on the Malabar Coast, the Nair Princesses dreamed up a sophisticated, harmonious society where women held a central position. Legend has it that the lush forest of Kerala produced magnificent blue birds with golden collars to pay eternal homage to the princesses. Since then, at the end of every day, these fabulous birds have created a unique and melodious love song that is carried on a floral, musky breeze up to the heavens. Beautifully boxed. Size: 50ml Natural Spray. Made in France. 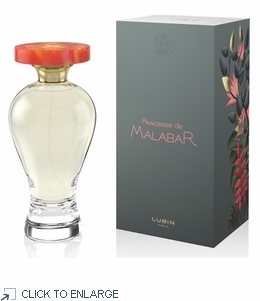 Lubin created the Les Princesses de Malabar fragrance in 2018. Beautifully boxed. Size: 50ml Natural Spray.